All API calls into Customer Thermometer must be made using this key. Do not disclose it to anyone. If you are concerned your key has been exposed, please contact us and we will supply a new one. 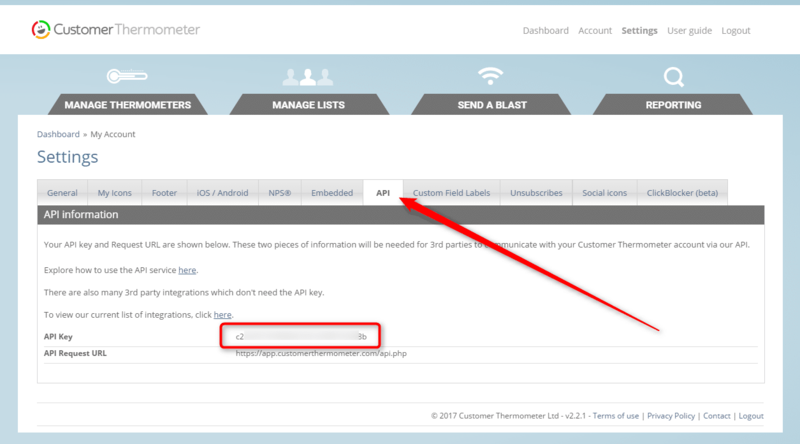 In addition to your unique API key, on that screen, you’ll also find the API request URL, used to make calls via our RESTful API. This method is designed to send a single Email Thermometer to a single user. You could use this to trigger Email Thermometers as part of workflows within applications. If the Thermometer blast ID is not passed then a new one will be created. Once the email has been sent, the Thermometer blast ID will be returned. If the user is unable to send any more emails for any reason then the return value will be 0.
blastID Integer Optional The Blast ID to log sends and responses against. If not supplied a new Blast, hence Blast ID will be created – this would mean creating Blasts of just one person. listID Integer Required The recipient List ID to add new email addresses to. This would need to be set up in advance. When executed, this string will trigger an Email Thermometer remotely from the application. It will use a prebuilt Thermometer template as indicated by the ID number. You will find the ID in the URL bar of your browser when inside the specific Manage Thermometer screen. It will take the contact data supplied and add that to the List ID you supply. Again this could already be set up with contacts within it – and this remote call will append additional contacts to that list. You will find the List ID in the URL bar of your browser when inside the specific Manage List screen. Finally, it will send the relevant Thermometer containing the contact data and add it as pending to the Blast ID which is supplied. Results will then be appended to that Blast ‘envelope’ on an indefinite basis. Return Type: Integer (indicating success or failure). This method will return an XML document containing a list of all of the Thermometer names and ID’s available inside the account linked to the API Key used. This method will return an integer containing the number of Thermometer credits currently existing inside the account linked to the API Key used. This method will return an integer (as a %age) showing the Happiness Factor (based on the last x values) for the account linked to the API Key used. limit Integer Optional Limit number of results to take into account (current result first). This method will return an integer (either positive or negative) showing the NPS score for a specific Blast ID or for the account for the account linked to the API Key used. Note, you could display an NPS score for your account for a single month for example. limit Integer Optional Number of results to take into account (current result first). Limit must be defined in conjunction by Blast ID or Date Range currently. This method will return an integer showing the Temperature Rating (as a percentage) for a specific Blast ID for the account linked to the API Key used. This method will return an integer (expressed as a percentage) showing the Response Rate for a specific Blast ID or for the account for the account linked to the API Key used. This will only take into account Email Thermometer Blasts and remove Embedded Blasts from the equation at account level. This method will return an integer showing the number of Responses received for a specific Blast ID or for the account linked to the API Key used. Would like to define TIME banded variables here – so you could display the number of responses for an account for March. This method will return an XML document showing the Responses received for a specific Blast ID or for the account linked to the API Key used. This method will return an XML document showing the comments received for a specific Blast ID or for the account linked to the API Key used. What is a Tablet Thermometer?